METRO CURVE 518-X shown with combination options i.e. 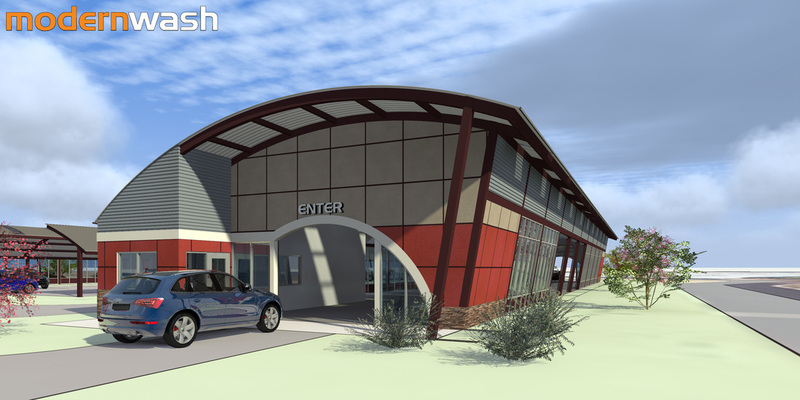 Angled Sidewall Widened Tunnel Design, Extended Overhangs,ARC Entry canopy and ACM Panels. The 518-X is an update to one of our really cool custom curve roof structures. This design offers a very clean modern appeal with superb functionality while adding our angled Sidewall Treatment as well as many other Custom touches i.e. our ARC Entry, Extended Overhangs, Widened Tunnel Design and enlarged Signage Transom. The 518-X incorporates these many options and packages them into our Special -X Series of Buildings. (Think Buildings that would make James Bond Proud!) The 518-X can be configured in many different sizes and shapes, making it easy to theme and brand. The enlarged corrugated sign panel at the transom areas makes an excellent backdrop for channel signage letters and or sign logos. The roof system of the 518-X is available with an optional daylight polycarbonate roof or one of our many colorful steel roof panels. The 518-X design is still what we term as an "offset" roof design . This means that one sidewall is a different height from the other. This look is a nice compliment to a standard curve roof design and by doing this we can take the taller sidewall and use it for dedicated signage. This can be very helpful if the monument sign options are limited on your site. Check out The 518-X as well as The AXIOM PRIME -X. The 518-X is available with or without an equipment room as a stand alone tunnel only. The equipment room may be integral (within the structure) or attached to the exterior of the structure in what is termed as a "L Shaped Design". The 518-X also features an available with a prominent "Tower Element" providing additional economical signage opportunities. The 518-X canopy can be extended at both the entrance and the exit ends allowing for efficient shading for the loading and or off loading of the vehicles. If you like the 518-X but want to go a step further then look at our AXIOM PRIME -X model which is the 518-X with an external or internal two story "Office Tower" structure. This model has it all with corrugated sign panels that run the length of the building as well as a signage tower. Of course you can always add above the roof eave sign bases for even more signage opportunities.